Recently, my husband and I had a wonderful lunch and a lively couples’ book discussion at our home. It’s always a pleasure to host and see people ease up and be themselves at the company and space you provide for them. We don’t have a lot of square footage in the house, but somehow, every one of our guests contribute to make it work for all. When preparing for the study, my husband agreed that we’ll stick to the basic premise and foundational structure of Biblical storyline of bringing together what is apart. Marriage is a union of two individuals. Surely, there are a lot of advice and a plethora of information to digest pertaining to married life. 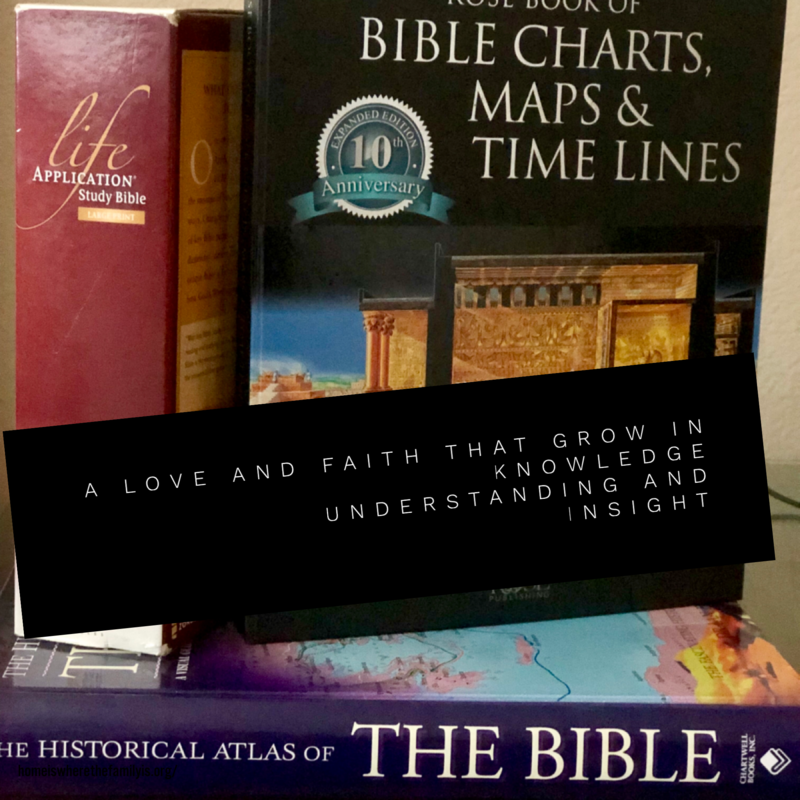 And so, what we committed to doing in our study is to highlight the heart of the Bible’s main message of unity through transforming love, being that Eggerichs’ book is marketed as a Bible-based self-help book. 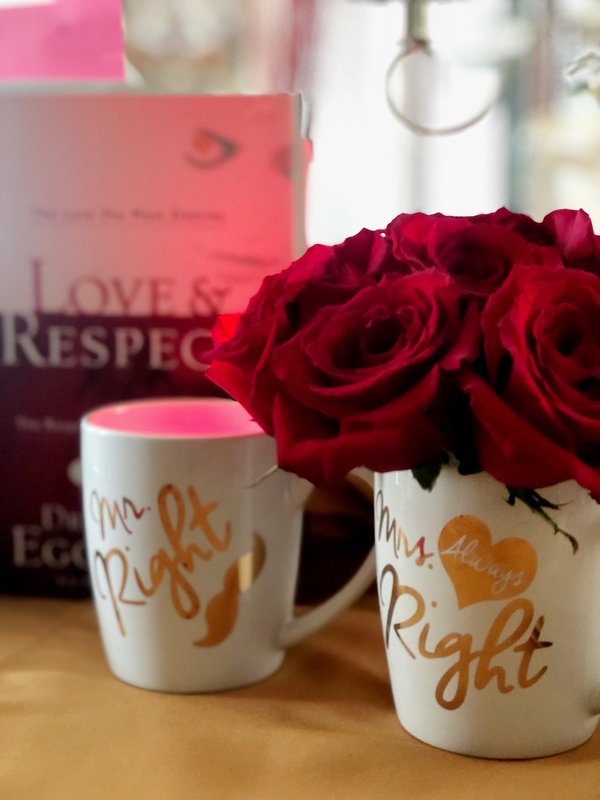 My husband and I took a different approach in tackling chapters 4 to 8 of Dr. Emerson Eggerichs’ popular married couple’s book, “Love and Respect.” We dug deeper into the theme and challenged a few of its audience-based premises. You see, while we do understand the intention of the author to help a husband and wife become more loving and respecting of each other, the disconnect that we see is that the book limited the scope of love and respect by designating each virtue as a gender-assigned need or as described by the author, a gender-specific dominant language. But what is perceived as a woman’s natural desire for love is actually a longing for acceptance or belonging, an inclination towards relationship and connection. Women have a higher degree of sentimentality compared to men. Instead of looking at it as a Propensity For Sentimentality, we believe that in the book, this nature is mislabeled as a love-based virtue. What has been referred to as a man’s need for respect in the book is actually a deep desire for recognition or an acknowledgment of strength or accomplishment. Men have been conditioned and expected to compete since very early in his life more so than women. It is a fact. Instead of tackling it as an Ego-Issue, Vic and I agree that in the book, a man’s inclination for recognition and achievement is discussed as a respect-based virtue. Since Eggerichs heavily referenced Dr. John Gottman’s research, we decided to share specifics in the group. We included several researched empirical facts and experts’ well-studied practical instructions to overcome marital conflicts. While we encouraged the husbands and wives to look into the deconstructed Christ-like definition of love and respect, Vic and I also facilitated an open discussion on a few real-life vulnerabilities and conflicts that a couple faces in their relationship. What Vic and I were aiming for in today’s discussion was to accomplish what we believe is the overall goal of the five chapters, which is to emphasize unity. However, we highlighted in our presentation that unity in marriage is a result of transforming love; a love that also produces respect. To help us achieve this and stitch the chapters together, we incorporated Inso Kim Berg’s miracle question. We adjusted the question to highlight a narrative of bringing two individuals together as one unit. We hope the discussion was enjoyable as it was instructive and informative. We opened the book meet by throwing a question that deals with what’s obvious and common. It’s easy to demand a change from our spouse. At the end of the discussion and after looking into the detailed study of forgiveness and expounding on a suggested dominant yet unifying language of a Christ-inspired love and respect between a husband and wife, we posted the third and last question. This time, the focus of the query is on the agreed couple’s goal of change. We concluded the discussion with a clear intent of joining two individuals to become one unit. PowerPoint copy of what we used in today’s book meet. And if you’re interested, check out the unabridged copy of what my husband and I put together in preparation for today’s book meet. Please note that none of our book meetings are intended to replace professional advice and interventions. What will it take to bring together what is apart? A miracle? Or a transformed heart and mind — an attitude of faith? That when both parties come to terms and acknowledge that God being the head leader and Christ’s example of love and humility as their core inspiration, both the husband and wife sees and live a co-equal share of power, openheartedness, and reliability. And that their marriage becomes a continuing discovery of a true union of two becoming one. Last year, Scott Treadway, lead pastor of Rancho Community Church presenter a Sunday lesson centered on purity and patriarchy. He briefly touched on the God’s take on gender equality and treatment of women. Follow the link for the full video of the sermon. I participate in a few ongoing book studies and book club. One of which is a private online community whereby the challenge is to read the New Testament (NT) in one year. I’m sharing in this post a personal reflective insight specific on Day 55, Mark 5:21-43. I made a few edits to expand the narrative a little bit and to fit the essay into a blog post. There is so much to digest on this day’s passage study. Mostly, when people want to do a deep study of Jesus’ ministry, they go more towards Matthew and John or even Luke before they read Mark. I find Mark’s narrative style as fascinatingly insightful. Mark’s accounts of Jesus’ healing and miracles and the casting of demons during his ministry and the emphasis on concealing Jesus’ identity as Messiah and Christ are evidentiary thematics. The Book of Mark is not a long read in comparison to the other gospels, although the author’s narrative is filled with action and his literary voice shows a sense of immediacy. How this book ended is a whole other literary exploration. 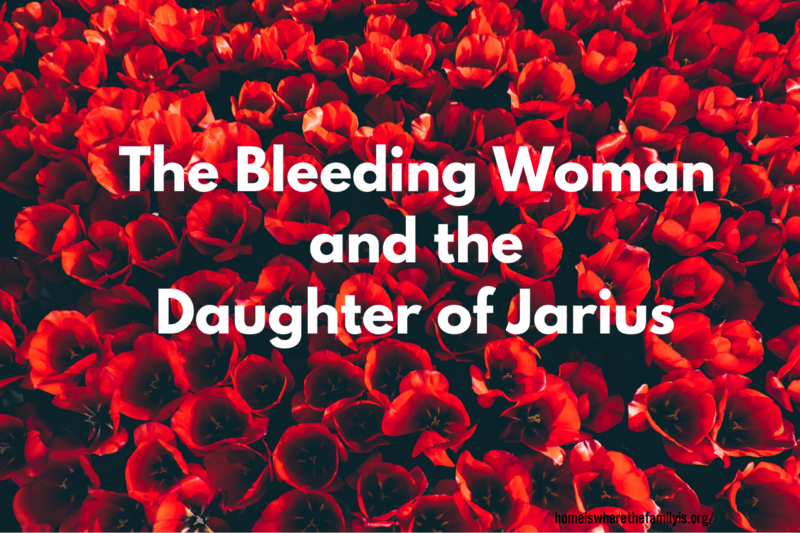 The story of the bleeding woman who was already suffering for 12 years and the young girl who just died and was literarily regarded as probably just 12-years-old is a good study of contrast. But first, the obvious similarity between the two is that they were both females. Their story conveys a similar religious belief that cast them as impure and thereby anyone who got into physical contact with them will be rendered ceremonially unclean. The difference was that the 12-year-old was depicted as unclean when she died. The Jews believed that touching a dead body defiled a living person. Are we punishing women for having periods? Did the Mosaic Law on purity help the overall being of women or did its implications push for the continuing neglect of women’s health and overall well being? A menstruating woman during that time was regarded as still unclean for seven more days even after the flow has stopped. Women during this time were marginalized for being a woman. Let that sink in for a moment. Imagine what it’s like for the bleeding woman who suffered for 12 years. Then, imagine the number of people she touched while she was making her way into the crowd for Jesus. Would they run away and do a ceremonial bath if they knew? What would they do to the woman? Maybe stone her to death? Imagine how people would have reacted if they had prematurely found out Jesus was touched by her. 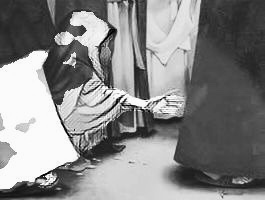 Understanding these scenarios put a context to the woman’s terror and horror when Jesus asked who touched His garment. But what boldness! She took a life and death risk. To me, it was undeniable that her knowledge of who Jesus was for her and her understanding of His providence was what motivated her to seek healing (or more like a new life). What an inspiring faith! In contrast, the 12-year-old girl was beloved by her father. The father advocated and pled for her healing. The bleeding woman was alone, abandoned. Is it not incredible that Jesus would address this woman as daughter? I am blown away! And I wonder, given the society’s religiosity and cultural norms, would the girl’s father have this sense of advocacy and drive for her daughter when she begins her monthly bleeding? What if she develops a menstrual-related condition such as the bleeding woman’s affliction, will he cling to the religious beliefs and join others in the eventual marginalization of her being? What is Jesus telling us in the crossover of these two stories? What is clear to me is seeing a pattern of the consistent narrative of Jesus’ ministry of shaking the status quo. He uses metaphors and direct examples of how, we as a society, should treat each other. It’s breathtaking, how constantly and consistently Christ has revealed how the narrow understanding of God and his precepts pulls people apart. And how hardened religious beliefs and societal demands and high moral expectations and kept humans, too, from developing a keen insight of God’s intention of unity and overall message of love. I’m taken at how meticulous, insightful, and purposeful Christ’s revelations of how-tos with regard to love and treatment of each other. In the different areas of today’s modern day society, how has the treatment of women changed? How do people from different culture respond to menstruation? The people during the ancient world used women’s monthly period and menstrual-related conditions to subjugate and oppress girls and women, do you think a version of this is still happening today? In your study of Jesus Christ while he was on earth and your understanding of his ministry and messages pertaining to love and unity, what insights have you formed about how women should be regarded in society? In terms of the culture of interpersonal relationships among all genders, what do you think Christ endorses based on how he broke social protocols and cultural and religious norms of his time? What do upside-down leadership and selfless service mean in Christ’s ministry? How does that translate to practical living? It should be easy for people now because we have the Bible, one would think. We see the characters, read between themes, and etcetera. But, we still get it wrong. And sometimes we get it wrong in a big way. Understandably so, especially in cases where the Bible has already taken the form of a God to us and when it’s utilized like a remote control for our personal understanding. Thankfully, God’s transforming love and grace endure. Faith is not blind obedience or acceptance. Faith in Christ comes from knowledge, understanding, insights, and trust in Him and in His ministry. Any theology or doctrine formed from a limited scope or narrow appreciation for empirical alternative views of the Scripture and which results in the oppression of any kind towards any person or group of people is not God-ordained. The practical assumption in the in-depth study of Christ’s ministry is that anyone who has faith in Him also believes and follows his edicts on unity and equality for all. Not all who claim belief has the understanding or insight of God’s upside-down leadership and order of importance and how these two are connected together and unified to the contextual messaging of God’s commandment on Love. The Bible is a unified literary collection of stories, poems, narratives, and excerpts meant to bring what is apart together. Any theology or doctrine formed from a synoptic understanding of the scripture that in any way promotes or results in a division is not God-willed. Here’s what I realized throughout countless times of sitting in Bible studies and Scriptural discussions. There is always a danger in target-reading a verse, connecting it to a few other verses and then weaving them in an independent narrative that isn’t aligned to the overall theme and message of the Scripture. Romanticizing passages poses risks, too. History tells us that the Scripture has also been used as a weapon to either advance evil ideologies or control a targeted group of people. Take the issues of slavery and the treatment of women for instance. Slave ownership is a long-standing practice in the history and economics of the ancient biblical times. Christian slaveholders used the Bible to justify slavery. Women during ancient times were the property of men and were bound to submission by virtue of cultural and religious beliefs. Christ introduced very radical changes to what were common precepts and practice in the cultural and religious setting. The mindset of treating women as unequal eased down a whole lot in time but several versions of women oppression continue to persist. Women are to be quiet. In America, it would take several more centuries after two millennia to give women their right of suffrage. However, the absolute truth is that slavery, oppression of women, and gender and human inequality were never God’s will and desire for these sow division, fear, and hate. While we have mostly gotten rid of slavery and made significant progress in the area of equality, there is certainly more work needed to attain God’s intention and mandate on unity and gender and human equality (Genesis 1:27-28, Galatians 3:28-29). Even when you think you are certain that your overall understanding of the Bible is aligned to the truth of God’s grace and unrelenting love of mankind and the world through Jesus, it’s a good practice in humility and a great opportunity to hone your critical thinking and relational skills to challenge (even dissect) your long-held personal beliefs and listen to other viewpoints. Consider openhearted discussions over debates. Given the doctrines and theologies you gathered from your exposure of the Scriptures, how have you applied Christ’s detailed messaging of the New Order of Love in the Upper Room? Have you done an in-depth study and wholehearted check on a certain hardline doctrinal and religious belief you hold and see whether it really promotes Christ’s message of unity and equality or if it is sowing division and oppression of others? 1. It is composed of 66 books written by 40 authors in three continents over a span of about two millennia, it is a unified literary piece. 2. The Bible has two sections, the Old Testament and the New Testament (also known as the Good News). The Old Testament is composed of 39 books while the New Testament has 27 books. 3. In studying the Bible, it is imperative that the reader understands it in the context of the author’s voice and intention, history, economics, geography, and culture. Being able to connect themes and plots to the overall message of the Scripture must be an integral part of the insight-development process. 4. The conditions during the period when the Bible was written include patriarchal society, monarchical governance, slavery, polydeism, and women were owned as property. 5. There is an inherent and palpable danger in formulating a doctrinal interpretation of any part of the Bible independent from its overall themes of unity and equality and core messages of restoration through God’s grace and unrelenting love. There is always a danger in target-selecting a verse, connecting it to a few other verses and then weaving an independent narrative that isn’t aligned to the overall theme and message of the Scripture. Often, a passage is misquoted for commercial use or unwittingly as an affirmation, or worse – to gain control over another group of individuals and then cause harm in the process whether unintentionally or otherwise. Watch out also for a tendency to romanticize a passage and the over-spiritualizing of messages. 6. Humankind’s salvation and unity with God through the death and resurrection of a Messiah is the ongoing theme of the Bible. The protagonist is God and sin is the recurring antagonist. It’s a compelling love story of what is apart coming together. 7. The Bible chronicles a gripping narrative of God’s grace and love of all human beings. It tells a dynamic and incredible story of change that brings people together in honor of God. It points towards a direction that restores God’s relationship with His creation and the humankind. The message is clear: God wants everything that is apart be brought together. Lastly, I encourage a reflection on the following questions. Are your religious or doctrinal beliefs preventing you and others from achieving unity in your relationships? Do religious and doctrinal hardliners affect your attitude and your willingness to discuss let alone consider social, political, economic, global and humanitarian standpoint? Did your assumed tenet push you to choose between science and religion? Over a year ago, Scott Treadway led a lesson about understanding the gospel in the context of God’s grace. Click here for the link, Scandal Of Grace. Here’s my personal definition of faith. Faith to me is an informed and confident response to God’s revelation. It is based on knowledge (of who and what God is), belief (in his being), and trust (safety under his care). And it is grown by continually seeking understanding and insight into all things about God. As James put it, faith without work is dead.